This name, with variant spellings MacCormack, Cormick etc., is an Anglicized form of the Old Gaelic (Scottish and Irish) patronymic MacCormaig i.e., "son of Cormac", a personal name from the early Celtic "corb-mac" meaning "chariot lad" or "charioteer". 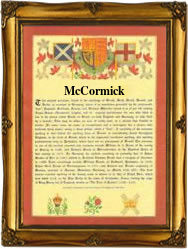 The Scottish family is a branch of Buchanan - MacCormick of MacLaine and the surname first appears on record in Scotland towards the mid 12th Century, (see below). In Ireland, the name is widely distributed throughout the four provinces with a leading sept residing in the Fermanagh - Longford area. The Annals of the Four Masters record the deaths of several prominent MacCormacks of Fermanagh; the last of these died in 1431. In 1478 a Gilbert McCormok was recorded in "Acts of the lord of Council", Scotland, and in 16th Century Ireland, the family are recorded as leading gentry in County Cork. On August 27th 1846 Jane McCormick, aged seventeen years, a famine emigrant to New York, embarked from Liverpool on the ship "Sea-of-New-York". The first recorded spelling of the family name is shown to be that of Gilecrisst Mac Cormaic, witness, which was dated 1134, "The Book of the Abbey of Deer", Scotland, during the reign of King David 1 of Scotland, 1124 - 1154. Surnames became necessary when governments introduced personal taxation. In England this was known as Poll Tax. Throughout the centuries, surnames in every country have continued to "develop" often leading to astonishing variants of the original spelling.